Status: Inactive; Active 1989-2004. Born: 1953-04-29. Spaceflights: 3 . Total time in space: 444.06 days. Birth Place: Kirya, Chuvashia. Educated MAI, served in NPO Energia prior to cosmonaut selection. PERSONAL DATA: Born April 29, 1953, in Kirya, Chuvashia (Russia). Married to Marina Lvovna Budarina (nee Sidorenko). There are two sons in the family, Dmitry and Vladislav. His hobbies include fishing, skiing, picking mushrooms. His father, Mikhail Romanovich Budarin, died in 1984. His mother, Alexandra Mikhailovna Budarina, died in 1986. EDUCATION: Graduated from the S.Ordzhonikidze Moscow Aviation Institute in 1979 with a mechanical engineering diploma. SPECIAL HONORS: Awarded the titles of Hero of Russia, and a Pilot-Cosmonaut of the Russian Federation. EXPERIENCE: Since 1976 Budarin has occupied the positions of engineer and leading engineer at the RSC ENERGIA. In February 1989 he was enrolled in the ENERGIA cosmonaut detachment as a candidate test cosmonaut. From September 1989 to January 1991, he underwent a complete basic space training course at the Gagarin Cosmonaut Training Center and passed a State examination. Budarin is qualified as a Test Cosmonaut. From February 1991 to December 1993, he took an advanced training course for the Soyuz-TM transport vehicle and the Mir Station flight. From June 27 to September 11, 1995, Budarin participated in a space mission as a board engineer of the 19th long-term expedition launched by the Space Shuttle and landed by the Soyuz TM-21 transport vehicle. From January 28 to August 25, 1998, he participated in a space mission as a board engineer of the 25th long-term expedition aboard the Mir Orbital Station. From Nov. 23, 2002 to May 3, 2003, Budarin logged over 161 days in space as Expedition-6 Flight Engineer aboard the International Space Station. The Expedition-6 crew launched on STS-113 Space Shuttle Endeavour and returned to Earth on Soyuz TMA-1. Test cosmonaut of NPO "Energiya." Resides in Kaliningrad. Moscow region. Born April 29, 1953, at Kirya settlement, Chuvashia, Russia. Mikhail Romanovich Budarin, father, deceased in 1984. Alexandra Mikhailovna Budarin, mother, deceased in 1986. Black hair; gray eyes; 5 feet 8 inches; 164 pounds. Graduated from the S. Ordzhonikidze Moscow Aviation Institute in 1979, with a mechanical engineering diploma. Married to Marina Lvovna Budalina, (nee Sidorenko). Two sons, Dmitri, 1977, and Vladislav, 1983. After graduation from the S. Ordzhonikidze Moscow Aviation Institute, he occupied various engineering positions at NPO "Energiya," where he was involved in experimental investigations and testing of space technology. In February 1989, N.M. Budarin was enrolled in a cosmonaut detachment as a candidate test cosmonaut. In the period from September 1989 to January 1991, he underwent a complete course of general space training and passed a State examination. He is qualified as a test cosmonaut. From February 1991 until December 1993, he prepared for a flight aboard the Soyuz-TM transport vehicle and the Mir Station as a member of a group. He has experience working in the primary operations group for space mission control. In January 1991, he began training to be the flight engineer of the back-up crew for the Soyuz-TM-21 transport vehicle. Family: Cosmonaut. Country: Russia. Spacecraft: ISS, Mir. Flights: Soyuz TM-21, STS-71 Mir EO-19, Soyuz TM-25, Soyuz TM-27, Soyuz TM-27 Mir Pegase, Soyuz TMA-1 ISS EP-4, STS-113 ISS EO-6. Agency: Korolev bureau. Bibliography: 12, 5216. 1953 April 29 - . Birth of Nikolai Mikhailovich Budarin - . Nation: Russia. Related Persons: Budarin. 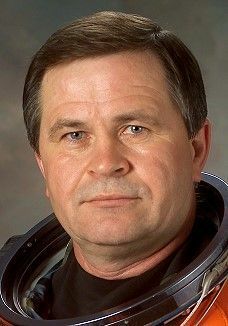 Russian engineer cosmonaut 1989-2004. 444 cumulative days in space. Civilian Engineer, Energia NPO 3 spaceflights, 444.1 days in space. Flew to orbit on STS-71 (1995), Soyuz TM-27, STS-113..
1989 January 25 - . Energia Engineer Cosmonaut Training Group 10 selected. - . Nation: Russia. Related Persons: Budarin, Kondakova, Poleshchuk, Usachyov. 1995 July 14 - . 03:56 GMT - . EVA Mir EO-19-1 - . Crew: Budarin, Solovyov. EVA Duration: 0.23 days. Nation: USA. Related Persons: Budarin, Solovyov. Program: Mir. Class: Manned. Type: Manned space station. Flight: STS-71 Mir EO-19. Spacecraft: Mir. Repaired solar array. Inspected exterior of station..
1995 July 19 - . 00:39 GMT - . EVA Mir EO-19-2 - . Crew: Budarin, Solovyov. EVA Duration: 0.13 days. Nation: USA. Related Persons: Budarin, Solovyov. Program: Mir. Class: Manned. Type: Manned space station. Flight: STS-71 Mir EO-19. Spacecraft: Mir. Retrieved TREK detector..
1995 July 21 - . 00:28 GMT - . EVA Mir EO-19-3 - . Crew: Budarin, Solovyov. EVA Duration: 0.23 days. Nation: USA. Related Persons: Budarin, Solovyov. Program: Mir. Class: Manned. Type: Manned space station. Flight: STS-71 Mir EO-19. Spacecraft: Mir. Installed Miras spectrometer..
1995 September 11 - . Landing of Soyuz TM-21 - . Return Crew: Budarin, Solovyov. Nation: Russia. Related Persons: Budarin, Solovyov. Program: Mir. Flight: Soyuz TM-22, STS-71 Mir EO-19. Soyuz TM-21 landed at 06:52 GMT with the crew of Budarin and Solovyov aboard..
1998 January 29 - . 16:33 GMT - . Launch Site: Baikonur. Launch Complex: Baikonur LC1. LV Family: R-7. Launch Vehicle: Soyuz-U-PVB. Soyuz TM-27 - . Call Sign: Kristall. Crew: Budarin, Eyharts, Musabayev. Backup Crew: Afanasyev, Haignere, Treshchev. Payload: Soyuz TM s/n 76. Mass: 7,250 kg (15,980 lb). Nation: Russia. Agency: RAKA. Manufacturer: Korolev bureau. Program: Mir. Class: Manned. Type: Manned spacecraft. Flight: Soyuz TM-26, Soyuz TM-27, Soyuz TM-27 Mir Pegase, STS-86 Mir NASA-5, STS-89, STS-89 Mir NASA-6. Spacecraft Bus: Soyuz. Spacecraft: Soyuz TM. Duration: 207.53 days. Decay Date: 1998-08-25 . USAF Sat Cat: 25146 . COSPAR: 1998-004A. Apogee: 373 km (231 mi). Perigee: 363 km (225 mi). Inclination: 51.70 deg. Period: 91.90 min. Soyuz TM-27 carried the Mir EO-25 crew and French astronaut Leopold Eyharts. NASA and the Russian Space Agency had hoped Soyuz TM-27 could dock with Mir while Endeavour was still there, resulting in an on-board crew of 13, a record which would have stood for years or decades. But the French vetoed this, saying the commotion and time wasted would ruin Eyharts Pegase experimental programme. Soyuz TM-27 docked at the Kvant module port at 17:54 GMT on January 31, 1998, less than five hours before Endeavour landed in Florida. Solovyov handed over command of Mir to EO-25 commander Musabayev, and the Mir EO-24 crew and Eyharts undocked from the forward port of Mir at 05:52 GMT on February 19 aboard the Soyuz TM-26 for their return home. On February 20, the EO-25 crew and Andy Thomas of the NASA-7 mission boarded Soyuz TM-27 and undocked from the Kvant port at 08:48 GMT. They redocked with the forward port on Mir at 09:32 GMT. This freed up the Kvant port for a test redocking of the Progress M-37 cargo ship, parked in a following orbit with Mir during the crew transfer. 1998 March 3 - . EVA Mir EO-25-1 - . Crew: Budarin, Musabayev. EVA Duration: 0.0658 days. Nation: Russia. Related Persons: Budarin, Musabayev. Program: Mir. Class: Manned. Type: Manned space station. Flight: Soyuz TM-27, STS-89 Mir NASA-6. Spacecraft: Mir. Internal Vehicular Activity. Inner and outer airlocks of Kvant-2 module were depressurised for EVA. However the crew could not open the outer hatch, repaired on 2 January 1998 by Solovyov and Vinogradov. The planned EVA was cancelled..
1998 April 1 - . 13:35 GMT - . EVA Mir EO-25-2 - . Crew: Budarin, Musabayev. EVA Duration: 0.28 days. Nation: Russia. Related Persons: Budarin, Musabayev. Program: Mir. Class: Manned. Type: Manned space station. Flight: Soyuz TM-27, STS-89 Mir NASA-6. Spacecraft: Mir. The Kvant-2 hatch had been fixed from within and was used for the EVA. Objective was to repair the damaged Spektr solar panel. Handrails were installed near the panel but the crew could not complete the work before the scheduled time ran out..
1998 April 6 - . 13:35 GMT - . EVA Mir EO-25-3 - . Crew: Budarin, Musabayev. EVA Duration: 0.18 days. Nation: Russia. Related Persons: Budarin, Musabayev. Program: Mir. Class: Manned. Type: Manned space station. Flight: Soyuz TM-27, STS-89 Mir NASA-6. Spacecraft: Mir. The crew succeeded in completing repair of the damaged Spektr solar panel. However the EVA was cut short when Mission Control in error commanded the Mir to drift. This was then misdiagnosed as a depletion of fuel of the VDU orientation engine, and the crew was ordered back into the station. 1998 April 11 - . 09:55 GMT - . EVA Mir EO-25-4 - . Crew: Budarin, Musabayev. EVA Duration: 0.27 days. Nation: Russia. Related Persons: Budarin, Musabayev. Program: Mir. Class: Manned. Type: Manned space station. Flight: Soyuz TM-27, STS-89 Mir NASA-6. Spacecraft: Mir. The cosmonauts began a series of three EVA's to install the new VDU station orientation engine (delivered by Progress M-38) into the Sofora boom. On this first spacewalk they disconnected the old engine (in use for six years) and pushed it into space..
1998 April 17 - . 07:40 GMT - . EVA Mir EO-25-5 - . Crew: Budarin, Musabayev. EVA Duration: 0.27 days. Nation: Russia. Related Persons: Budarin, Musabayev. Program: Mir. Class: Manned. Type: Manned space station. Flight: Soyuz TM-27, STS-89 Mir NASA-6. Spacecraft: Mir. Installation of the new VDU station orientation engine assembly was completed at the end of the Sofora boom..
1998 April 22 - . 05:34 GMT - . EVA Mir EO-25-6 - . Crew: Budarin, Musabayev. EVA Duration: 0.27 days. Nation: Russia. Related Persons: Budarin, Musabayev. Program: Mir. Class: Manned. Type: Manned space station. Flight: Soyuz TM-27, STS-89 Mir NASA-6. Spacecraft: Mir. Two truss structures on the Kvant module and the new Sofora VDU station orientation engine assembly was unlatched from Progress M-38..
1998 August 25 - . Landing of Soyuz TM-27 - . Return Crew: Baturin, Budarin, Musabayev. Nation: Russia. Related Persons: Baturin, Budarin, Musabayev. Program: Mir. Flight: Soyuz TM-27, Soyuz TM-28, Soyuz TM-28 Mir EO-26/-27, Soyuz TM-28 Mir EP-4. Soyuz TM-27 undocked from Mir at 02:05 GMT on August 25, with Musabayev, Budarin and Baturin aboard. They landed on August 25 at 05:23 GMT near Arkalyk in Kazakstan..
STS-113 MCC Status Report #15 - . Nation: USA. Related Persons: Bowersox, Budarin, Herrington, Korzun, Lockhart, Lopez-Alegria. Program: ISS. Flight: STS-111 ISS EO-5, STS-113, STS-113 ISS EO-6. 2002 December 20 - . International Space Station Status Report #02-54 - . Nation: USA. Related Persons: Bowersox, Budarin, Pettit. Program: ISS. Flight: STS-113 ISS EO-6. 2002 December 27 - . International Space Station Status Report #02-55 - . Nation: USA. Related Persons: Bowersox, Budarin, Pettit. Program: ISS. Flight: STS-113 ISS EO-6. 2003 January 10 - . 2003 January 15 - . International Space Station Status Report #03-3 - . Nation: USA. Related Persons: Bowersox, Budarin, Pettit. Program: ISS. Flight: STS-113 ISS EO-6. 2003 February 5 - . 2003 February 6 - . STS-107 MCC Status Report #24 - . Nation: USA. Related Persons: Bowersox, Budarin, Pettit. Program: ISS. Flight: STS-113 ISS EO-6. 2003 February 7 - . STS-107 MCC Status Report #25 - . Nation: USA. Related Persons: Bowersox, Budarin, Pettit. Program: ISS. Flight: STS-113 ISS EO-6. 2003 February 10 - . STS-107 MCC Status Report #26 - . Nation: USA. Related Persons: Bowersox, Budarin, Pettit. Program: ISS. Flight: STS-113 ISS EO-6. 2003 February 11 - . STS-107 MCC Status Report #27 - . Nation: USA. Related Persons: Bowersox, Budarin, Pettit. Program: ISS. Flight: STS-113 ISS EO-6. 2003 February 21 - . 2003 February 28 - . International Space Station Status Report #03-9 - . Nation: USA. Related Persons: Bowersox, Budarin, Foale, Kaleri, Malenchenko, Pettit. Program: ISS. Flight: STS-113 ISS EO-6. 2003 March 7 - . 2003 March 14 - . International Space Station Status Report #03-11 - . Nation: USA. Related Persons: Bowersox, Budarin, Pettit. Program: ISS. Flight: STS-113 ISS EO-6. 2003 March 21 - . 2003 March 28 - . International Space Station Status Report #03-13 - . Nation: USA. Related Persons: Bowersox, Budarin, Pettit. Program: ISS. Flight: STS-113 ISS EO-6. 2003 April 4 - . International Space Station Status Report #03-14 - . Nation: USA. Related Persons: Bowersox, Budarin, Lu, Malenchenko, Pettit. Program: ISS. Flight: STS-113 ISS EO-6. 2003 April 8 - . International Space Station Status Report #03-15 - . Nation: USA. Related Persons: Bowersox, Budarin, Lu, Malenchenko, Pettit. Program: ISS. Flight: STS-113 ISS EO-6. 2003 April 11 - . International Space Station Status Report #03-17 - . Nation: USA. Related Persons: Bowersox, Budarin, Lu, Malenchenko, Pettit. Program: ISS. Flight: STS-113 ISS EO-6. 2003 April 25 - . 2003 April 28 - . 2003 May 2 - . International Space Station Status Report #03-20 - . Nation: USA. Related Persons: Bowersox, Budarin, Lu, Malenchenko, Pettit. Program: ISS. Flight: Soyuz TMA-2, STS-113 ISS EO-6. 2003 May 4 - . International Space Station Status Report #03-21 - . Nation: USA. Related Persons: Bowersox, Budarin, Lu, Malenchenko, Pettit. Program: ISS. Flight: Soyuz TMA-2, STS-113 ISS EO-6. Landing of Soyuz TMA-1 - . Return Crew: Bowersox, Budarin, Pettit. Nation: Russia. Related Persons: Bowersox, Budarin, Pettit. Program: ISS. Flight: STS-113 ISS EO-6. The loss of the shuttle Columbia on the STS-107 mission grounded the shuttle fleet and meant that the Soyuz TMA-1 attached to the ISS would be used in its lifeboat role for the first time. Soyuz TMA-2 carried the EO-7 skeleton crew to the ISS with the mission of keeping the station in operation until shuttle flights could resume. This allowed the EO-6 crew, after their extended stay aboard the ISS, to finally return home. They readied the TMA-1 for landing and then undocked from the ISS at 22:40 GMT on 2 May. This marked the first return of American astronauts in a Soyuz capsule (though several had ridden Soyuz capsules to the Mir station). During the re-entry, the first for the Soyuz TMA-1 model, the guidance failed and the capsule reverted to a rolling ballistic re-entry. This subjected the crew to over 8 G's, as opposed to under 3 G's for a normal Soyuz lifting re-entry. It also resulted in a landing 460 km short of the target. Soyuz TMA-1 landed at 2:07 GMT, but htere was a delay of over two hours before recovery forces arrived at the capsule. 2003 May 9 - . International Space Station Status Report #03-22 - . Nation: USA. Related Persons: Bowersox, Budarin, Lu, Malenchenko, Pettit. Program: ISS. Flight: Soyuz TMA-2. 2003 May 16 - .